1. Set up your barbecue for indirect grilling, with the coals banked to one side. Go easy on the amount of charcoal you use; less is more as you want to roast the cauliflower, not burn it. (Alternatively, preheat the oven to 120˚C, gas mark ½.) 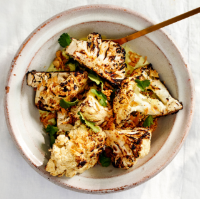 Cook the cauliflower directly over the coals (or in a griddle pan), turning regularly, until caramel brown on all sides – about 4-6 minutes. Transfer to the non-coal side (or oven) and cook for 25-35 minutes, uncovered, turning regularly, until tender but with some bite. 2. Meanwhile, whizz the chilli with the salt in a small food processor (or bash in a pestle and mortar); set aside. For the sauce, blend the avocado with the soured cream, cumin and coriander stalks until smooth. Add the lime juice and season to taste. 3. Once the cauliflower is ready, put it in a warm bowl; add the butter and some of the chilli salt (keep the rest in a jar). Toss and serve on top of the sauce, scattered with the crispy onion and coriander leaves.